Christian funerary Mosaic of Matziceus who was from Libyia and this funerary mosaic reads, ‘ the faithful Matziceus lived in peace for 42 years, rested on the fifteenth of the calends of June’. 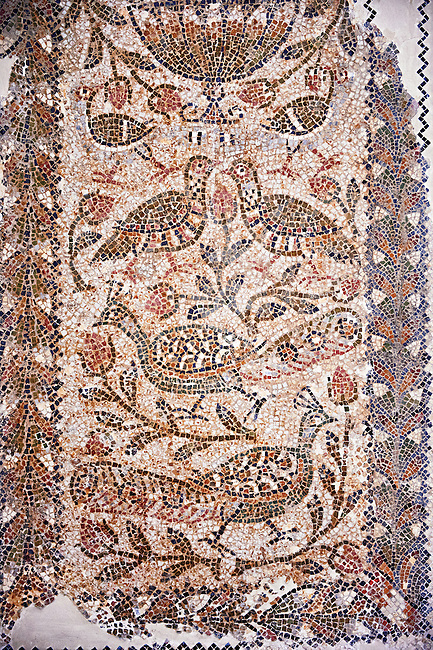 The mosaic depicts two tendrils of vine thrusting out of a cantharus with peacocks & birds. This early Christian mosaic is from Demna Parish Church, left aisle, 5th century AD. Roman mosaics from the north African Roman province of Africanus . Bardo Museum, Tunis, Tunisia.